Many of the Tribal Jewelry items sold on Tribal Muse are unusual and one-of-a-kind items that we have been lucky enough to find and pass along to you. Several are Collectible Museum Quality pieces. In addition to authentic Tribal Jewelry, Tribal Muse also sells new Tribal Jewelry reproductions, identified as "contemporary" in their descriptions. Even though recently made, these reproductions are handcrafted by local Tribal Jewelry artisans who skillfully apply the age-old techniques, styles, and patterns associated with their tribal groups. Finally, our carefully selected Ethnic Jewelry captures the Tribal Spirit in new machine-crafted jewelry similar to that found in department stores. Authentic Tribal Jewelry conveys not only a culturally idealized outward appearance, but also reflects a way of life that is steeped in socio-cultural tradition. It is not only beautiful, but often communicates messages about the wearer's status, wealth, spiritual beliefs, and functional habits. It also marks group affiliation, communal celebrations and individual rites of passage. Tribal Jewelry is jewelry made by indigenous tribal artisans using local materials to create objects of adornment that contain significant cultural meaning for the wearer. Authentic handcrafted Tribal Jewelry is very different from what you will find in department stores. Tribal Jewelry pieces are rarely uniform in shape or exactly symmetrical. The materials used are those found locally, with content and quality varying among the different cultures, artisans, and across time. There may be missing stones, broken sections, considerable wear patterns, and debris still clinging to them from having been displayed in the local market place or along the roadside for sale. Much Tribal Jewelry has traveled around the world from village to village, and generation to generation – these irregularities are part of its charm, heritage, and value. Tribal jewelry artisans choose their materials very carefully, based on availability, tradition and symbolic meaning. The colors are those of nature - the rich blues of turquoise and lapis lazuli, the glowing reds of carnelian and coral, the creamy whites of pearl and bone, and the toasty warm hues of amber and horn – elements that have been used in jewelry-making since antiquity. In most tribal cultures, Silver is the metal of choice, with Gold applied only sparingly, usually as a delicate gilding, if at all. More recently, Silver in the form of whole or melted coins has been incorporated into Tribal Jewelry, often quite ingeniously, as with the famed Maria Theresa Thaler since the 1700's. There is no denying that Tribal Jewelry is primarily intended to be worn as a form of beautiful adornment. Ideals of beauty vary greatly from one tribe to another, however. What one group considers beautiful, another group may find unappealing. Yet all these pieces are unique decorations that are highly treasured by their respective Tribal groups and collectors around the world. Usually considered the domain of women, Tribal Jewelry may just as easily be worn by men. The pieces are often multi-purpose and used interchangeably - a jewelry piece worn as a necklace one day could become a headpiece the next. On different occasions, a pendant might be part of a necklace, pinned to clothing, woven into the hair, or hung from a belt as a waist ornament. Often the back of the body was decorated just as lavishly as the front in an exuberant display of tribal prowess. Tribal Jewelry has been acknowledged as a repository for wealth since antiquity. Once accumulated, it is easily converted into currency or used directly in barter. It is almost always a significant portion of the marriage dowry, providing a measure of the value placed on the match. Although Tribal Jewelry artisans were usually men, it was the women who actually owned the pieces, acting as keepers of the family's fortune. During times of crisis, their jewelry provided the family with a financial cushion to avoid ruin. In more prosperous times, their supply of jewelry would be replenished, ready for wear or to be stored in preparation for the next economic downturn. The exchange of Tribal Jewelry through commercial trade seems to be virtually universal. Native American Indians traded Wampum beads throughout the new world for centuries before Europeans ever arrived; copious amounts of pearls and shell found their way through commerce to land-locked regions of Asia; and old Venetian glass beads were marketed so extensively in Africa that they are now synonymously identified with much of the Tribal Jewelry from that continent. Tribal Jewelry also makes a statement about the wearer's status within a group. According to the archeological record, certain stones, such as Lapis Lazuli could only be worn by royalty. In Turkmen cultures, young girls wear domed head-caps (gobbah) indicating their marriageability. Once married, the same woman would exchange her gobbah for an ornate silver head-band (egme) that unmistakably communicated her new marital status. Similarly, Padaung (Kayan) women living between Burma and Tibet wear distinctive neck rings, with new coils added as they age giving them the appearance of having elongated giraffe-like necks. Besides being beautiful, some Tribal Jewelry is both practical and functional. Here are some examples. Communication. The large cylindrical Tumar pendants worn in Central Asia and India were ideal for carrying written messages from one person to another. Servants brought them to the intended recipients – with the caps of the Tumar carefully sealed beforehand to prevent those with prying eyes from opening them. In some tribes, the design of the jewelry itself might provide a hidden communiqué – for example, Massai women gossip with each other by imbedding coded messages within a deliberate juxtaposition of colors when beading their necklaces. Hygiene Aid. Other Tribal Jewelry pieces served as hygiene aids, such as the bejeweled silver toothpicks and ear cleaner pendants of the Turkmen. Work Aid. Some Tribal Jewelry is utilitarian, assisting with chores. In Tibet, for example, milkmaids wear ornately decorated fang-shaped pendants at their waist to support the milk buckets while they worked. Protection. Tribal Jewelry routinely plays a role in both physical and spiritual protection. The Ouled Nail women of Algeria, for example, used their spiked bracelets to defend themselves from overly exuberant admirers when they danced. The large size of Turkmen women's jewelry supposedly mimics the armor that ancient tribal women wore when fighting as warriors alongside their men (although this interpretation is debated). Even the placement of jewelry around the neck, wrists and chest is considered paramount in protecting the most vulnerable parts of the body from injury. Perhaps more intriguing, however, is the wearing of Tribal Jewelry as amulets and talisman to protect the spiritual body. Amulets and talisman are very similar. Amulets allow only beneficial energies to reach the wearer, whereas talisman also repel evil forces. Frequently Tribal Jewelry combines the properties of both an amulet and a talisman into one piece. Examples of amulets include the coins and ornaments attached to a beggar's necklace in India for attracting more generous donations. Similarly, the Dzi bead of Tibet is believed to bestow various blessings upon the owner, depending upon the bead's chosen design. In Central Asia, Turkmen boys wear a stylized bow and arrow (ok-yai) pendant on their backs to improve their luck when hunting. Other amulet styles are thought to have mystical powers that can increase fertility, femininity, masculinity, bravery, wisdom, vitality, health, crops, etc…there is an amulet intended to attract every desirable thing imaginable. Among the most recognizable talisman is Evil-Eye jewelry, believed to deflect an evil-eye gaze sent by another person. The concept of the evil-eye is widespread, spanning centuries and continents. An evil-eye could be cast deliberately out of envy, or completely unintentionally. In some cultures, almost any utterance or gesture would be suspect. 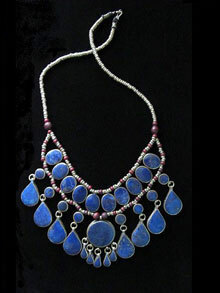 Wearing evil-eye jewelry or displaying evil-eye wall hangings protects the wearer from this danger. Turkish evil-eye beads are perhaps the most famous, shaped like blue-and-white eyeballs, or in the form of a Hamsa (open palm of right hand). Other jewelry amulets-talisman include Tibetan aromatic herbal pendants, fangs and beastly heads on bracelet terminals, and symbolic carvings on jewelry surfaces. The Western world is already familiar with wearing jewelry to convey religious affiliation, such as with the Christian Cross and Hebrew Star of David. Similarly, Tribal Jewelry often expresses a spiritual connection, for example, through jewelry such as the Tibetan Om, the Crescent shape, or etched sacred verses. Various cultural jewelries include chamber boxes for holding prayers or religious teachings, as with the Gau of Tibet, the Heykal of Central Asia, and the Telsum of Ethiopia. In most tribes, religious and social beliefs are so indelibly linked together that they are indistinguishable from one another. Spiritual symbolism, therefore, will often be embedded within the design of the Tribal Jewelry itself, overshadowing any other meaning or use the piece might have. 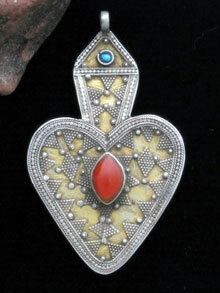 Tribal Jewelry may instantly identify the owner as affiliated with a specific cultural group. The men of the Dayak tribe in Borneo, for example, wear very large earrings that associate them immediately with one of the eight tribes on that island. The Lingayats of Orissa have unique Lingam necklaces placing them among a group of Hindus who revere Shiva above all else. 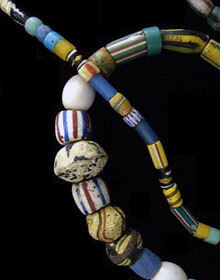 Similarly, people who put on the distinctively-patterned Kiffa beads from Mauritania align themselves at once with that specific area of Africa. Membership in any of these groups leads to certain expectations by others, as well as to a sense of belonging for the person wearing the jewelry. Often Tribal Jewelry is so extravagant that it would be impracticable for everyday use. Instead, it is carefully stored, and only taken out for special ceremonies and celebrations. The Bhil tribe of Northern India, for example, wear large decorated beads of glass and clay during the joyful 40-days of their Gavri Festival. Tribal elders travel village-to-village, delighting residents with traditional stories and celebrating at each venue. Gavri beads are an integral part of those ceremonies, communicating purpose and connection among participants. Similarly, Miao ritual dancers of Northern Cambodia wear ornate silver-colored headdresses that express the ancient traditions linking the celebrants together. A Rights of Passage is very similar to a ceremony, except that it recognizes one individual's achievement rather than that of an entire group. It represents a personal milestone, ushering a person from one stage of life to the next…birth, menstruation, graduation, marriage, parenthood, death, and similar events of great personal meaning. The Tribal group acknowledges the importance of these events by holding rituals and celebrations that include wearing specific Tribal Jewelry pieces. A Turkmen woman's engagement celebration, for example, includes giving her gifts of heart-shaped silver Asyk (Asik) pendants that she attaches to her braids… the more Asyks she is given, the more blessing will be bestowed upon her and her new family when she marries. After her wedding ceremony, the same Turkmen woman may wear gold-washed (gilded) jewelry, but not before. Symbolism in Tribal Jewelry is such an immense area of focus, that we are devoting an entire section of our website to this subject. Please see Symbolism in Tribal Jewelry for more information on this vast topic. Jewelry from Afghanistan almost always includes deep-blue Lapis Lazuli – a stone that has been used for millennia in jewelry making and is often associated with royalty in archeological excavations. Sparkling bits of pyrite fleck its deep blue color, giving it the appearance of the night sky – a symbol of endless possibilities. The finest Lapis Lazuli in the world comes from Afghani mines, along with jade, agate, carnelian, and turquoise. Silver and coin metal (silver-nickel alloy) are the metals of choice. Gold is rarely used in Afghan jewelry, except for the occasional gilding. For decades, Afghanistan and surrounding regions have experienced war and difficult times. Many jewelry artisans moved away or are unable to find traditional materials and tools to work with. 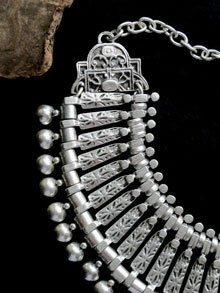 As a result, much of the new Afghan Jewelry is ruggedly constructed using metal alloy (gilet). The artistry remains, however, with traditional Tribal styling still evident in even in the most roughly hewn pieces. 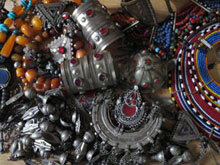 Generally, new Afghan Jewelry is worn as casual wear or for dance. With some exceptions, it is among the Vintage and Antique Afghani Jewelry where you will find the Museum Quality and Collectible pieces. Afghan Jewelry is frequently included under the Turkmen and Kuchi Jewelry categories because their geographic areas overlap. Africa is an entire continent, not just a region. Its Tribal Jewelry expressions are far too varied to capture just one specific style or ideal form. There are numerous books and publications on the hundreds of African Jewelry traditions for those wanting to know more. Tribal Muse has a selection of jewelry pieces from this inspired continent. We are fortunate to have Tuareg Jewelry from Morocco, Berber pieces from Algeria, as well as jewelry from Kenya, Ghana, Nigeria, and Mali (and more as we find them). Please see our African Jewelry webpage for more information. Miao or Hmong Tribal Jewelry comes from a group of Asiatic people who migrated away from their homelands in what is now the Western Provinces of China. Many currently reside in the Golden Triangle and hill regions of northern Thailand. Their jewelry is typically made of 99% Silver or a zinc-copper-nickel metal alloy that is artistically handcrafted into neck rings and large earrings. It will usually be inscribed wistfully with cloud and floral motifs, or with a classic bent-spear design intended to celebrate the hunt. Hmong earrings may have such thick ear wires (gauged) that very large earlobe piercings are required to wear them. Some earrings are so large that they are meant to be attached to hair braids and headpieces as their primary support, rather than hanging independently from earlobes. The Kuchi are a nomadic group of people living throughout Central Asia who have traveled freely across international boundaries for centuries. 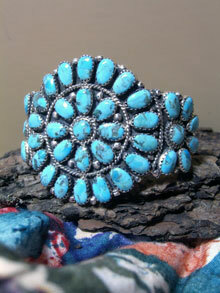 Kuchi jewelry and clothing is renowned for its vibrant energy, exuberant designs, and flamboyant spirit. It is alive with color and over-the-top embellishments, which some might consider gaudy, but which Tribal Jewelry aficionados recognize as uniquely Kuchi. This jewelry is especially popular for dance and daily wear, combining the vitality of the multiple cultures and traditions that the Kuchi people visit in their wanderings. It is perhaps the most fun to wear of all the Tribal Jewelries. 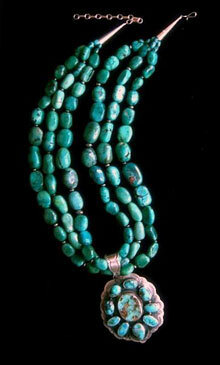 The celebrated Native American Indian Jewelry that we know and love today is actually a rather recent development. Although the luminous Turquoise, Oyster Shell, and Black Jet beads have been used for millennia to make North American adornments, the silverwork and distinctive techniques so characteristic of today's Native American Indian Jewelry are relatively new, having been introduced by early Spanish Silversmiths. The various tribes soon developed their own unique styles and artistry that readily distinguishes one tribe's jewelry from the next. In addition, individual artisans created their own personal Hallmark or stylized signature…look for these Hallmarks on pieces of authentic Native American Indian Jewelry. Since 1999, it is illegal to claim that a piece of jewelry is Native American Indian Jewelry when it is not. 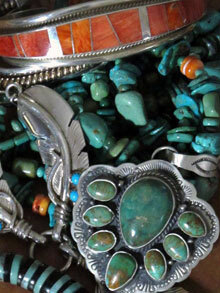 That is why all the Native American Indian Jewelry pieces on Tribal Muse have been certified. 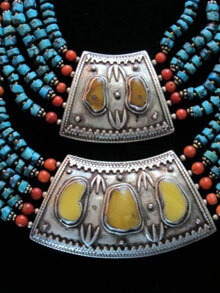 Similar-looking pieces that are not so certified are identified as "Southwestern Jewelry" in their descriptions, and not as Native American Indian Jewelry. Perhaps the most familiar of all Native American Indian Jewelry, Navajo Jewelry has bold inscribed silverwork with nugget-sized Turquoise beads. These wonderful pieces are often of impressive size, with large pendants hanging from one or more beaded strands. One of their most famous jewelry styles, the Squash Blossom Necklace, contains a large inverted crescent-shaped pendant called a Naja. Navajo artisans use exquisite Turquoise stones extracted from the various mines throughout the Southwestern USA, ranging in color from tea green to robin's egg blue. The celebrated Santo Domingo, or Kewa Pueblo Jewelry is famous for its tiny, precisely hand-carved, shell-beads called Heishi (today the term heishi describes similar beads of any material). Kewa Pueblo heishi is further distinguished by being exceptionally smooth to the touch when you run a strand of it through your fingers. This is because the native carvers buff the outside surfaces of each bead against a turning wheel, shaving away any barbs or irregularities until only a smooth surface remains. Some say that Kewa Pueblo (Santo Domino) Jewelry is the most refined of all the Native American Indian Jewelry traditions. Meticulously made Zuni Jewelry contains small lozenge-shaped beads arranged in delicate-looking designs. 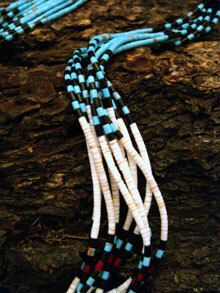 Stones and shell beads are the focal points in Zuni Jewelry, with silver playing a secondary role to the beads. Consequently, Zuni artisans make their jewelry by assembling beads into vibrant mosaic clusters that deliberately mimic the patterns of nature. Their jewelry is often more light-weight than their Navajo counterparts, but it is equally as beautiful, and arguably more painstakingly crafted. The Zuni also produce hand-carved stone animal fetishes and superb channel inlay jewelry. Contemporary Fair Trade Jewelry from Peru supports the local artisan communities. All of our Peruvian Jewelry is handcrafted using indigenous stones, including Turquoise, Agate, Chrysocolla, and Peruvian Opal. The metal of choice is Alpaca (Alpaka), a lightweight, silver-colored metal alloy of zinc, copper, and nickel that does not rust or tarnish. Handmade Peruvian Jewelry has a pristinely delicate look at an affordable price. 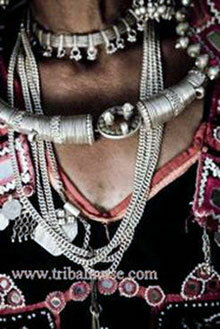 Tibetan Tribal Jewelry is among the most beautiful and well made of all the old Tribal Jewelry traditions. It is typically made of high-grade silver that was skillfully crafted with ornate and profuse symbolic representations covering all surfaces. Amber, Turquoise, and Coral are the most commonly used stones. Because the Tibetan Plateau was once part of an ocean floor, native white conch shell is also available and harvested locally for use by Tibetan Jewelry artisans. Most of Tibet is located in the high mountains, giving this area the nickname "Roof of the World." Many Tibetan Jewelry pieces include a cloud motif in their designs as a tribute to these natural phenomena that are ever-present at this extreme elevation. Buddhist and some Hindu traditions also contribute much to the rich symbolism that embellishes Tibetan Jewelry. Today, few old Tibetan Tribal pieces remain, most making their way to market via Nepal, which borders this region. In addition, Tibetans have always been a nomadic people, traveling and trading frequently. The exact origin and background of specific pieces, therefore, are often impossible to determine. Turkmen (Turkoman; Turcoman; Turkman) Jewelry hails from a nomadic group of people who have lived for centuries in southwestern Central Asia and northeastern Iran. Located along the old Silk Road Trade Route that connects the East and the West, this region includes present-day Turkmenistan, Uzbekistan, Tajikistan, and parts of Kazakhstan and Afghanistan. Turkmen Jewelry has a characteristically distinctive style consisting of large silver or metal pieces, regally crafted, and typically encrusted with carnelians or red glass beads set in raised bezels. 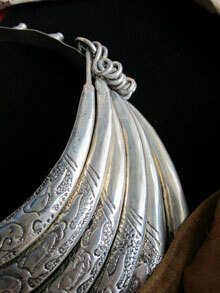 The large size of Turkmen Jewelry pieces is said to represent the armor worn by ancient Turkmen women who fought alongside their men in battle, although this interpretation is in dispute. In addition to being visually beautiful, Turkmen Jewelry is intentionally constructed to also sound beautiful…hence the prolific attachments of bells, coins, and noisy dangles that clank and jangle with every movement. While Turkmen Silver Jewelry is frequently Gold-washed (gilded), Gold itself is almost never used for the body of a piece. Detailing is meticulous, consisting of carefully incised patterns and tiny embossed plaques (medallions) fused to jewelry surfaces and conforming to the various tribal traditions. Twisted, coiled, and whipped silver wire designs are also prevalent…techniques which even today cannot be replicated by machine. 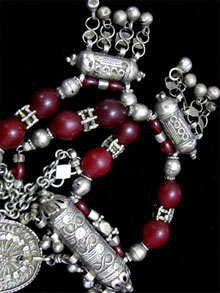 Red is the most commonly used color for beads, usually consisting of carnelians or red glass. Russian or even Mongol influences are clearly evident in styling, especially among jewelries from the eastern territories, since much of that region was under Soviet rule until fairly recently. Women are highly valued members of Turkmen society. In art and lore, they are always identified with life-giving forces, especially with water and water-associated creatures such as fish, salamanders, and frogs. In addition, the abundant jangling fringes on their jewelry looks and sounds like rain…another source of vital water that is considered quintessentially feminine. It is the custom for Turkmen women to surround their faces with profuse amounts of fringed jewelry, whether it is hanging from their temples or ears, on top of their heads, across their foreheads, attached to noses, in their hair, or even sewn directly onto their clothing, caps, and veils. The Turkmen are also among the few tribal people who embellish the backs of their bodies with jewelry just as lavishly as they do on the front. This enthusiasm for ornamentation is not just limited to humans. Turkmen decorate their horses and camels just as passionately as they do themselves, joyously adorning their livestock with elaborate and richly bejeweled trappings. 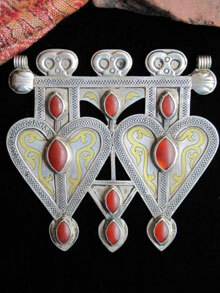 The variety of shape and design found in Turkmen Jewelry is astounding. Round and triangular shapes represent the feminine, whereas square and rectangular shapes symbolize the masculine. Diamond-shaped Doonbajik clasps and ornate square Gonjik (Gonjuk) pendants were often attached to cloaks or on long sashes worn as outer garments. A form unique to Turkmen Jewelry, the sophisticated Dagdan represents the sacred Dagdan tree to some, while others see a 2-headed eagle that faces opposite directions. Another is the Adamlyk, a stylized (anthropomorphic) female form that appears prolifically on Turkmen necklaces, headdresses, Tenechir (temple pendants) and earrings. Similarly, a sacred pentagonal shape, the Asmalyk was originally worn by Tribal men and is also prevalent in Turkmen textile designs. Other common forms found in the abundant array of Turkmen Tribal Jewelry include representations of frogs, birds, fish, bow and arrow, feather tufts, flowers, leaves, rams horns, hearts, hexagons, cylinders, crescents, rhomboids, tree of life motifs, and spheres. This extraordinary Tribal Jewelry can be further subdivided into Turkmen subgroups and similar nearby traditions. I have included some of them briefly below. Perhaps the most easily recognizable of Turkmen Tribal Jewelry, Tekke (Teke) Jewelry is characterized by Gold-wash (gilding) over etched silver designs and vivid red carnelian or glass beads set in raised bezels. It is highly artistic, with stylized birds, flames and spiritual creatures etched into the surface, frequently with a running border of rams horns, bird heads, or floral trefoil motifs. Tekke Turkmen Jewelry is highly prized by Collectors and those who love to wear these extraordinarily beautiful pieces. Yomut Turkmen Jewelry pulls out all the stops. In its most flamboyant form, a piece of Yomut Jewelry may be gilded entirely with gold, embossed, studded with multi-colored beads, and haphazardly adorned with numerous decorative plaques and small ornate medallions fused to the surface. Of course not all Yomut pieces are quite so elaborate. Many may have only one or a few of those attributes, the most notable being the fused decorative plaques. They are extremely collectible, and very beautiful. 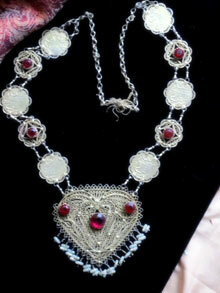 Ersari Turkmen Tribal Jewelry is understated and thoughtful. In sharp contrast to the more elaborate Turkmen styles, Ersari Jewelry has few extra embellishments, relying more on form and functionality. Each line and bead is meaningful and precise. Old Ersari pieces are hard to find, and highly valued by collectors. 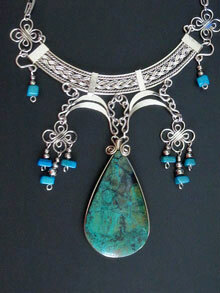 Jewelry from Kazakhstan can be breathtakingly beautiful. While similar in style and function to other Turkmen Jewelry, it is more delicate and finely made, with a distinctive repeating triangle design that is quintessentially Kazakh. Skillful jewelry artisans use the granulation technique to achieve this characteristic pattern, by purposefully fusing tiny pieces of silver onto the jewelry surface. Like Turkmen Jewelry, pieces may be gilded and studded with carnelians or other stones set in raised bezels. 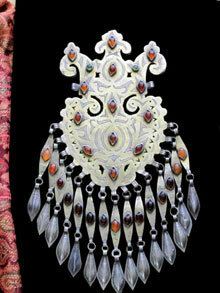 Kazakh Jewelry is among the most well crafted and beautiful jewelry in the world. It is highly collectible. Graceful and elegant, jewelry from Uzbekistan is exquisitely made, often incorporating small beads and pearls, the liberal use of Gold and gilding, and fanciful filigree work. Other common techniques include niello, open work, and enamel. One of the most famous pieces in Uzbek Tribal jewelry is a jewel-encrusted bride's diadem (tiara) with flowing symmetrical curves that replicate the arches of the eyebrows. Many Uzbek women continued to wear these gorgeous tiaras until after the birth of their first child. Uzbek men are especially fond of embellishment as well, wearing huge ornamental silver buckles and jewel-studded sheaths for their daggers. 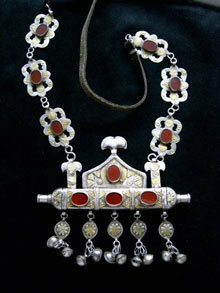 Tajik Jewelry: Uzbek Jewelry is sometimes described as inclusive of the Jewelry from Tajikistan. 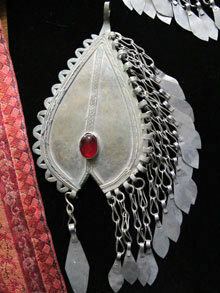 Though similar, Tajik Tribal Jewelry contains a greater amount of coral, and features the nose-ring which is not commonly found in other Turkmen Jewelry traditions. 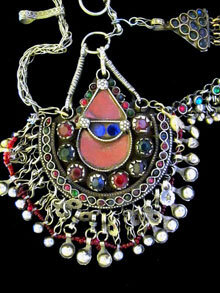 Karakalpak Jewelry is decidedly Central Asian, echoing the styles and techniques of Turkmen Jewelry. It has a noticeably bold construction, with an obvious Russian influence. This is not surprising, considering that the area known as Karakalpakstan (now part of Uzbekistan just south of the Aral Sea) was under the Soviet umbrella during the last century. I could not possibly improve upon the quality and depth of information provided at the Karakalpak Jewelry website. I highly recommend this link to anyone wanting to know more about this fascinating culture and its jewelry traditions. Turkey is a remarkable country, a land that fuses the great traditions of both East and West, seemingly without difficulty. Descriptions of Turkish Jewelry are often limited to Evil Eye jewelry intended to protect the wearer from any harmful Evil-Eye glances sent their way. More recently, however, a new style of Turkish Jewelry has arrived - one that, like its culture, fuses Eastern and Western traditions perfectly. Tribal Muse is proud to carry a large selection of contemporary Turkish Jewelry, mostly made of Silver-Plated Pewter that captures the essence of the tribal spirit. India is a vast sub-continent. It is considered part of Asia and has over one-billion inhabitants. Seventy-five percent of those people, however, live in relatively small villages and rural areas, where 1000-year-old tribal customs remain richly preserved and integrated into daily life. Although India is one of the few tribal traditions with Gold Tribal Jewelry, its prevalence is very small compared to Silver jewelry, and even then the use of gold is restricted mostly to urban areas or to the elite populations of the South. 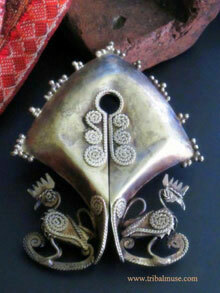 By far, the vast majority of fine Tribal Jewelry from India is made of Silver. 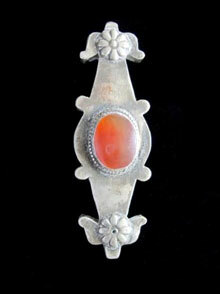 Some of the finest Sterling Silver pieces in the world are made by the jewelry artisans of Rajasthan India. Oddly, India's natural supply of Silver is relatively low. Active international trade over several centuries and robust silver imports during English rule, however, allowed India to amass large quantities of silver currency and ingots. It is no surprise, therefore, that much of the silver jewelry from India is made using whole or melted down silver coinage. The Tribal Jewelry of rural India is ruggedly designed and sturdily constructed so as to withstand the rough onslaughts of daily life. Styles vary widely from Pradesh (state) to Pradesh, and tribe to tribe. Casual Jewelry from India is made of white metal (gilet; gillet); this metal looks like silver but is really an alloy of lower content silver combined with copper, nickel and/or zinc. The East Indies, now known as the Malay Archipelago extends over 2500 islands located between Southeastern Asia and Australia. It includes Indonesia (Sumatra; Java; Singapore), Borneo, the Philippines (Luzon), Brunei, East Malaysia, and East Timor (some include New Guinea here as well). Many of the primitive tribes in this vast region were ferocious headhunters until fairly recently, yet the complexity and variety of their tribal artistry is unsurpassed anywhere. The Dayak of Borneo make exquisitely crafted beadwork, the Sarawak of Malaysia wear huge lobe-stretching earrings, and the tribes of Sumba hone perfectly hammered bronze marangga pendants as wide as a man's chest. Routinely incorporating natural elements, Tribal Jewelry from these islands often includes tusks, bone, teeth, hair, horn, feathers, shells, and plant materials of all kinds. One of the oldest and most refined jewelry traditions, Yemeni Jewelry is renowned for its beauty and skillful filigree work. Centuries ago, early Jewish Yemeni silversmiths initiated many of the techniques still currently in use throughout Northern Africa, Central Asia, India, and the Middle East. Jewelry from Yemen is similar in style to that of ancient Sumeria, including its cylindrical amulet cases for containing religious verses and magical incantations, the ornately crafted globe beads, and the generous inclusion of silver coins. If you have other questions or comments, please submit the completed form below. It may take me a few days to get back to you, but I do respond to all inquiries. Thank You for visiting us at Tribal Muse.